Violinist Midori is a legendary performer, gifted educator, and an innovative community engagement activist. Zubin Mehta first heard Midori play in 1982, and it was he who invited her to make her now legendary debut – at the age of 11 – at the New York Philharmonic’s traditional New Year’s Eve concert, on which occasion she received a standing ovation and the impetus to begin a major career. In recognition of the breadth and quality of her work, she was given the prestigious Crystal Award by the World Economic Forum in Davos in 2012. Also in 2012, she was elected to the American Academy of Arts & Sciences and awarded an honorary doctorate in music by Yale University. Midori has created a new model for young artists who seek to balance the demands of a performing career at the highest level with a hands-on investment in teaching and the power of music to change lives. 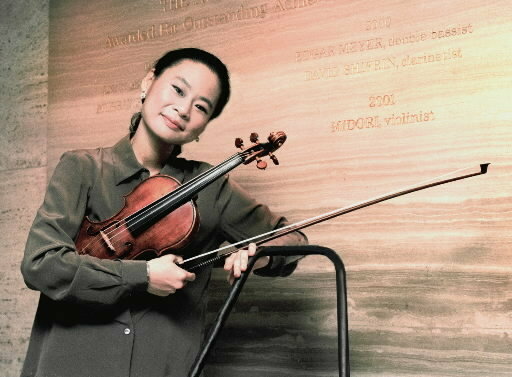 Midori is currently a professor at The Curtis Institute of Music. She was formerly a Distinguished Professor of Music at the University of Southern California where she was the Jascha Heifetz Chair.